Fuerteventura is one of the top choices for a sunny winter break if you're from the UK or from the rest of Europe. The Canary Islands are your best choice if you're looking for the warmest winter destination in Europe, where you can sunbathe even in January or February. 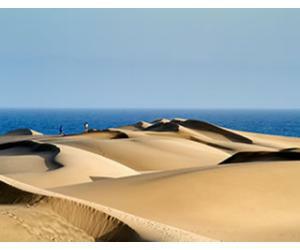 Fuerteventura's climate is classified as subtropical-dessert, as the island is the closest to Africa from the archipelago. Entallada Lighthouse is actually the closest point to Africa, situated at only 100 km distance and it's a lovely place to visit and admire the view. The Canary Islands are often called The Islands of the Eternal Spring, as their weather is pretty constant throughout the year, especially when compared to other countries on mainland Europe. As you can see, the temperatures were pretty much constant throughout the month in 2017, with minimum variations. 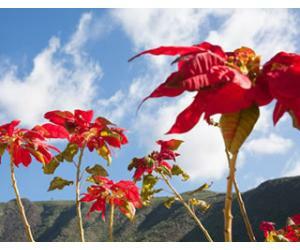 Winter is the rainiest season in Fuerteventura, with December being the month with the most amount of rain usually. In February, usually there's no more than 3 days of rain on the island, so you can rest assured that you'll most likely come back with a tan from your holiday. As we usually do, we recommend that if you're staying in the north of the island for example and you see that the weather is not great, you can hop on a bus or car rental and go down south. Or, if you're in a chill mode, you can always do a pub crawl and discover all the fabulous bars and restaurants in Fuerteventura. Does it snow in Fuerteventura? The island is practically a desert, so no snow here, don't worry about that. How about the breeze - how windy is Fuerteventura in February? 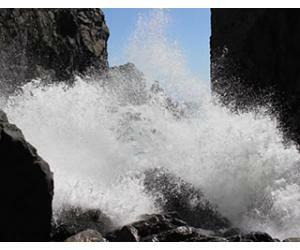 Fuerteventura could literally be translated as Strong Wind, although it's not the explanation for its name. If there's anything that may make you feel cool during the days it's the wind that sometimes can blow hard, but it depends on where you are staying. For more details, please read our dedicated article about wind in Fuerteventura, where you can get a better understanding of the subject. Nights can feel pretty chilly in the winter months, especially due to the wind. A light jacket or a cardigan is necessary to have, perhaps even a parka or a rain jacket, to be sure that you're prepared for all types of weather. Although during the daytime you will most likely be in your shorts and a T-shirt, in the evening you may need a pair of long trousers, so it's good to come prepared. Or you could do some shopping while in Fuerteventura, since the month of February should still be part of the winter sales season. Also, don't forget your bathing suit, as in Fuerteventura every month is a beach month. Remember to always use a sun lotion also, even if you think it's not hot enough outside to get burned - the UV index in the Canaries is usually higher compared to most places in Europe, so it's easy to be fooled. 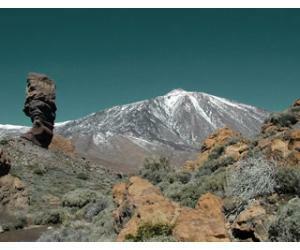 For further details, read the dedicated article about what to pack for a holiday in the Canary Islands. Ocean temperatures are measured for Corralejo. Can you swim in February in Fuerteventura? At an average temperature of 18.6°C / 65.5°F, the sea is probably too cold for most people to swim, although you can sometimes find a natural pool or a sheltered cove where the sea is warmer. But our recommendation for the winter months would be to book a hotel or a place that has a heated pool, this way you will be able to make the most of the sunny days. 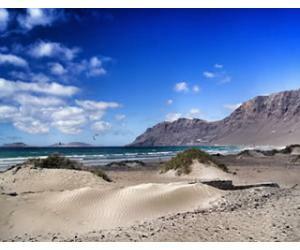 Fuerteventura gets an average of 7 hours of sunshine per day. Although some mornings might start a bit cloudy, the sun usually come out by 11 am on most days. You will still have enough time to work on your sun tan, but you can also sit in the bars (you have plenty of options whichever resort you choose) and just watch the world go by! While 7 hours of sunshine is considerably less than what the island get during the summer months, you should keep in mind that back home in the UK or any other part in Europe it's freezing at this time of year, so the weather in Fuerteventura in February is an improvement from all points of view. The weather in Fuerteventura is pretty much the same in all the resorts, so we'd advise to choose the one that you love best - that is, if you've previously visited the island during another season. If it's your first visit to the island, then you should know that the north - El Cotillo and Corralejo, tend to be a bit more cloudy compared to the south: Caleta de Fuste, Costa Calma and Morro Jable. For a first timer to the island you should also check out the article about where to stay in Fuerteventura, so you can decide which of the resorts would be best for you. February is usually carnival month in all the resorts, so it's likely that you'll have ocassions to party on most nights. You can read more about carnivals in Fuerteventura, if you want to know the exact dates for each party and parade. All of the towns and resorts organize a carnival each year, so if you're truly passionate about partying like the Spaniards, you should move around the island and celebrate carnival season more than once. February is a good month for wandering and explorations, especially if you want to do something else than sunbathing. There are so many things to do in Fuerteventura and beautiful places to discover, that you will be able to see a new place every day, if you want to. Flag Beach is one of Fuerteventura's most well known beaches and it's part of Corralejo Grandes Playas, situated inside the natural park. Although the ocean water is colder than in the summer month, it still retains its turquoise colors and beauty, so it's ideal for long walks even in February. 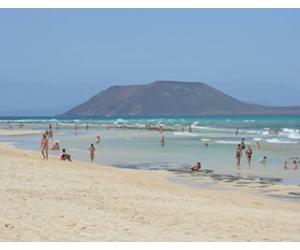 Jandia has some of the most famous beaches in Fuerteventura. 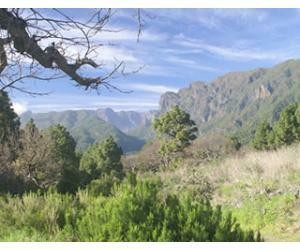 Our advice is to hire a car and drive there to explore. Especially if it's a cloudy day in the north, you may have the pleasant surprise to see that it's sunny in the south. 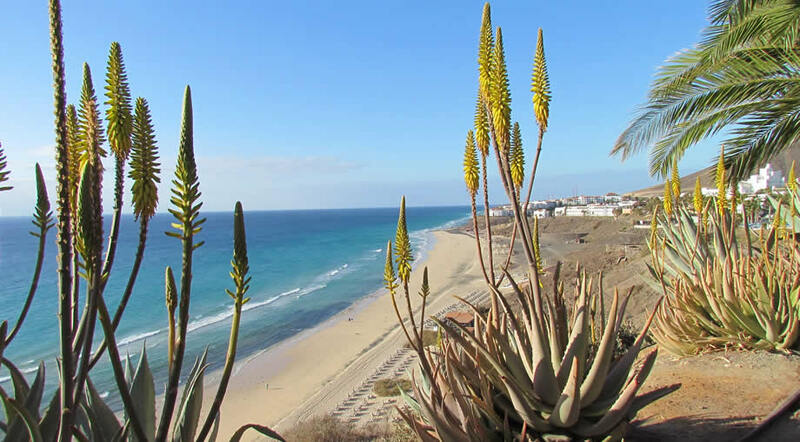 Sotavento is literally the picture perfect beach that you see on many postcards of Fuerteventura. Depending on the tide level, the beach can look completely different and it's a great place for kite surfing, especially in the area of Playa Barca. Sotavento beach is located in the south of Fuerteventura, which tends to be sunnier than the north especially in the winter months.